Kate McKinnon and Mila Kunis are both funny ladies. Having them get wrapped up in the world of espionage, similar to what Melissa McCarthy pulled off with Spy, is just a great idea. 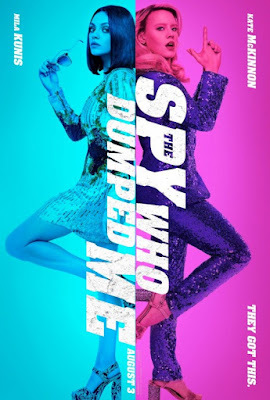 And it looks like director Susanna Fogel has pulled off the new comedy, The Spy Who Dumped Me, because this trailer is hilarious. The title is an obvious riff on James Bond film The Spy Who Loved Me, but this looks closer to Spy or Spies Like Us than anything else. McKinnon and Kunis play friends who get entangled in a global conspiracy when one's ex-boyfriend turns out to be a secret agent. McKinnon has been smart, killing it in these mid-level comedies like Rough Night and Office Christmas Party. The same goes for Kunis in both Bad Moms movies. They could probably carry a film like this by themselves but together should be comedy gold. Also starring Sam Heughan, Justin Theroux and Gillian Anderson, The Spy Who Dumped Me opens August 3rd.